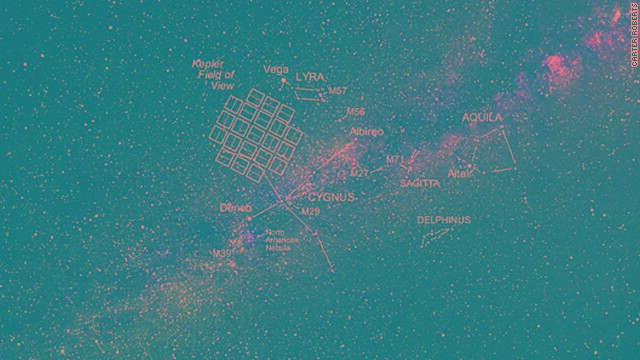 This is the area of the sky where the Kepler telescope is focused. Do you hear the stars? Listen here. At the Georgia Tech Sonification Lab, scientists have turned all sorts of data sets into music, including stock market prices and election results. Now, they've turned to data from distant stars. The band Echo Movement wanted the researchers to turn data from stars into music for their upcoming album. The Georgia Tech team used data from Planet Hunters, an initiative that allows anyone - even you - to help find planets. It uses information from NASA's Kepler telescope. "We all just kind of individually looked on that website, looked for stars that looked roughly close to any kind of sound signal, something that we thought would make a good sound," said project leader Riley Winton, who will start as a graduate student in the fall. The musical composition was inspired by data about the star Kepler 4665989. Specifically, scientists are interested in the level of brightness of the star as its companion star crosses it; this is called a binary star system. The telescope recorded the values of brightening and dimming of the star during a one-year period. Winton said he and colleagues scaled the data and used software programs to fit data to curves and apply sinusoidal (wave) patterns to the data, resulting in cleaner tones. They also edited out the pops and clicks that would be in the raw product. Data from a different binary star, Kepler 10291683, allowed them to create a tremolo effect. The result, which Echo Movement's Dave Fowler used as the basis for a melody, is now part of the introduction to the Echo Movement song "Love and the Human Outreach," to be released in September. Listen to the sample here. Related: Hearing sound in outer space? awesome!!! Echo Movement rules, I can't wait for this new album its gonna be amazing!!!!!!!!!! This is awesome they have already done some cool stuff with their last album so I cant wait to see this new song style from them!!! The music of the spheres, indeed - the ancients were right, but not in the way they thought. This sounds like an Amateur Radio ( HAM Radio ) transmission method called JT65. ( There are others ). JT65 is a weak signal system of communications used for EME ( earth moon earth ) communications. Have a look at the link http://hflink.com/jt65/ . It's a method of communication using low power levels at the transmitting site and complex dataprocessing algorithms at the receiving site. The sound tones and cadence of frequency changes are too familiar to be star based in my opinion.